Rhymes have the power to engage us with their pattern of repetition in sound and rhythm. We are encouraged to think along and our mind starts to participate. Perhaps we wonder how will the rhyme end? Can I come up with an ending word of my own? Participation stirs imagination, forming images in our minds letting us relate to the story. Children can easily relate to the characters in stories that rhyme. 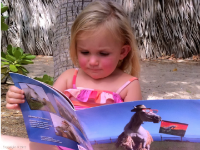 Thus the child’s curiosity is stimulated and the child experiences reading in an engaging and positive way. Over time the recognition of similar sounds are noticed and as comprehension develops the knowledge that the same letters make the same sounds is acquired. The child begins to understand that words are made up of sounds by using the same vowels in certain sequence. While reading rhymes the rhythm helps us to breath properly, the feel for timing gets developed and the correct use of the tongue and space inside the mouth are encouraged to form the correct sounds. The groundwork for reading and later writing is laid. Phonetics are one of the most important parts of reading and writing and are at the basis of understanding how to sound out words; while rhyming this is practiced with ease. Children built awareness of sound patterns that make up spoken words, and will start to notice that segments of words form the same sounds. Sound patterns in language as well as literacy are best promoted by exposing children to many different ways of using language through interaction with adults. Rhymes create imagery in both the reader and the listener, children will often feel compelled to chime in and speak the words as they remember them from the last reading. Rhymes and poems are playful, socially engaging and developmentally important for hearing, identifying and experimenting with the sounds of language. Rhymes are easily played out and will stimulate creative expression through movement, enhancing the ability to retain new words through auditory and muscle memory into the ever-expanding treasure of the child’s vocabulary. Heidrun Metzler was born in Germany and holds a degree in social pedagogy and early childhood education. Metzler loves the beautiful inner spirit of horses, which lead her to explore natural horsemanship and trick training. She also enjoys photography and living in Hawaii with her husband. Heidrun Metzler is the author of the children’s picture book Skeeter’s Dreams.